Congratulations to Andrew Bickersteth of the College Division Hoosiers for being named our “Detroit Hustle Player of the Week” for his performance in Saturday’s showdown with the Chippewas. Andrew helped lead his team to their first win of the season with his tough and determined effort. SHOCK 16, LIBERTY 15: In the first game of the season Liberty’s (0-1) star Frankie Zalewski led all scorers with 8 points, but it wasn’t enough to stop the Shock’s (1-0) dynamic duo of Frankie Kulpa (6 points) and Sofia Acuna (4 points). COMETS 15, SPARKS 14: Nora Tillman scored a team high 8 points for the Sparks(0-1), but the balanced attack from the Comets(1-0) led by Campbell Bozek (6 points) was hard to overcome. FIREBIRDS 16, CRUSH 14: Ta’Teyanna Williford scored a game-high 10 points as the Firebirds (1-0) started the season off strong. Londyn Hall scored 6 points to lead the Crush (0-1) who dropped a tough one to start the season. ANGELS 24, REBELS 14: Jacey Roy (6 points), Jaya Jackson (6 points), and Brooke Brown (5 points) combined for 17 points as the Angels (1-0) played a complete game on Friday night. The Rebels (0-1) were led by Tess Tillman and McKinley Reid, who each scored 6. WILDCATS 25, HUSKIES 22: This College Division showdown of undefeated teams lived up to the hype as these two heavyweights traded blows for 36 minutes. Chase Kukes was a force, as he totaled 18 points, helping the Huskies (3-1) stay in the game. For the Wildcats (4-0), a balanced scoring attack, led by Beau Kennard (7 points) and Nolan Davis (6 points) helped them remained undefeated. BULLETS 58, SONICS 55 (2OT): In a double overtime Legends Division thriller, the Bullets (1-3) picked up a huge victory against the Sonics (2-2). Having lost each of their two previous games by a single point, the Bullets hung tough and were able to get over the hump on Saturday. Dylan Dembs scored 6 overtime points for the Bullets (13 for the game), Ethan Wise scored a game-high 21 points and Max Tushman netted 9 points. The Sonics were led by Noah Kam’s 15 points and Jacob Bylinowski’s 14 points. The Bullets hit 10 three-pointers to go along with 5 from the Sonics. The combined 15 three-pointers from both teams set a new Legends Division record for threes in one game. WOLVERINES 24, BRONCOS 15: The Wolverines (2-2) jumped out to an early 8-point lead (12-4 at halftime) and kept pace in the second half to secure their second win of the season. Drew Heckman scored 10 points for the Wolverines. Mason Rothschild led the Broncos (0-4) with 10 points. RAIDERS 28, KNIGHTS 17: The Raiders prevailed in this one, improving to 2-1 on the season with their 2nd consecutive victory. Taye McKinney scored a game-high 14 points and Devin Young added 10 points for the Raiders. Lance Kukes led the Knights (1-2) with 6 points, while Mazen Saber scored 5 and Ryland Simmons netted 2 points and 5 rebounds. RAVENS 26, FALCONS 24: In a tough and scrappy game, it was Saba Pachulia who shined on offense, as he scored a game-high 20 points, including some clutch free throws, allowing the Ravens (1-2) to knock off the previously unbeaten Falcons (2-1). Zackary Kozouz scored 12 points to lead the Falcons, who also received strong contributions from Parker Rost (6 points) and Manuel Calderon (3 points). SPARTANS 43, HOYAS 29: Nick Batey and Landon McKinney each scored 10 points for the Spartans (3-1), who are on a nice roll of late. Their offense is improving and their stout defense has made life difficult for their opponents. Eli Yen scored 15 points for the Hoyas (1-3) and Joey Hesano added 9 points. Connor Cotant chipped in 6 points and great defense for the Spartans. HOOSIERS 30, CHIPPEWAS 15: Quran Creary scored 15 points to lead the Hoosiers to their first win of the season. After coming up just short the first few games, the Hoosiers (1-3) were able to break through against the Chippewas (2-2). 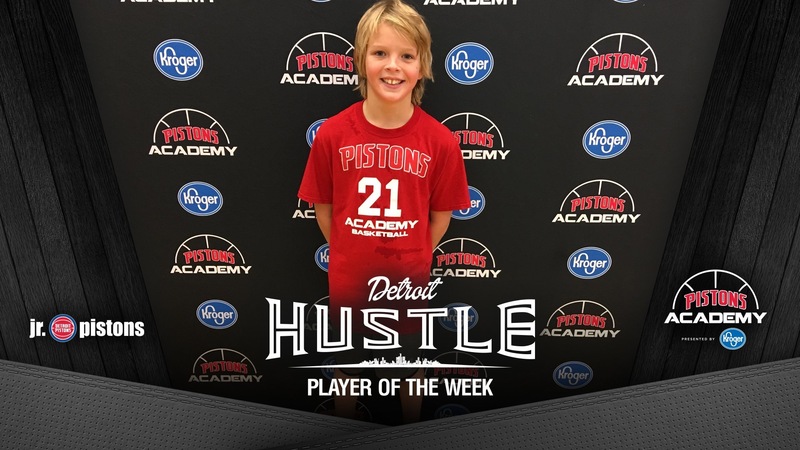 Andrew Bickersteth, this week’s Detroit Hustle Player of the Week, provided great effort and toughness on the defensive end. Spencer Sherr, Aaron Robinson and Henry Weiss each score 4 points for the Chippewas. BLAZERS 47, SPURS 45: The Blazers won a thriller on Saturday, taking down the Spurs in a back-and-forth contest. It was the Blazers’ first win of the season and their weekly improvement finally paid off in the win column. Ryan Hanks scored a game-high 14 points for the Blazers (1-3) and Adam Shewcraft added 12 points. The Spurs (1-3) were led by Anthony Egdell (9 points), Alex Koellner (7 points) and Jacob Drouillard (7 points). CELTICS 31, BULLS 20: Xavier Lane scored 10 points, Ben Diskin added 9 points, and the Celtics (4-0) remained unbeaten in the Pro Division. For the Bulls (2-2), Jalen Palmer, Alex Hesano, Parker Levin and Lucas Kennard each scored 4 points. TROPICS 47, SPIRITS 40: Bryan Thomas scored 12 points to lead the Tropics (4-0). Jack Genzlinger and CJ Krause both added 11 points, fueling the Tropics to a big 2nd half. The Spirits (1-3) were led by Brandon Talley’s 17 points. Omar Zeni (5 points) and Nick Wagner (6 points) also played well for the Spirits, who have been getting better and better.